What Lives in a Wetland – We incorporate an environmental education aspect into a preexisting conservation project to introduce (or more accurately, repatriate) the imperiled striped newt back into the wetlands it formerly inhabited. This program is open to community and student organizations, schools, and teacher groups. To book your field trip, contact Rebecca (rebecca@coastalplains.org). 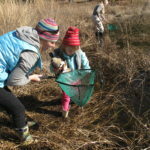 Adopt an Ephemeral Wetland – We are into our 5th year of this very popular program. 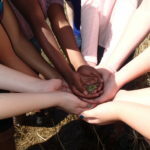 Volunteers adopt a wetland (or 2), are trained in amphibian ID and provided equipment, then go off on their own to survey the amphibians in that wetland at least twice a year. If you are already a participant and looking for the Resources page, click here. 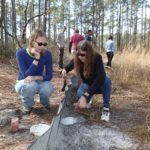 Striped Newt Repatriation Team – Our striped newt repatriation project involves checking drift fences with associated bucket traps, that encircle four wetlands in the Apalachicola National Forest, every day from January through July. Obviously we could use some help and that’s where our Team comes in! We train you and you volunteer to check the fences at your convenience using an online sign-up calendar. Email Rebecca (rebecca@coastalplains.org) to be notified about training opportunities. The Wetland Wagon – We know not every teacher can take advantage of What Lives in the Wetland and bring their students out to our research site, so we are bringing our research to the classroom. 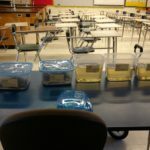 Our ‘Wagon’ brings the unique amphibian species that depend on ephemeral wetlands to students along with an engaging, educational standards-aligned lesson plan. We are currently seeking funding to continue this program. If you cannot participate in these opportunities but would like to support our efforts to build communities that conserve wetlands, please consider making a tax-deductible donation. Using the special Donate button below will ensure your contribution goes directly towards purchasing equipment, training volunteers, and educating our community on the importance of ephemeral wetlands and the amphibians that utilize these unique landscape features.